The standard design of electrical outlets hasn't changed for years. The typical off-white, bevel-edged, rectangular fixtures practically represent Americana. But they don't have to be boring. Modern home designers are using all kinds of things to spice up dull outlets. If you're not willing to be stuck with outlets from the past, you can update their look with some moldings or trim. Jazz up a boring outlet with some wood trim. Profiled molding styles range from about 1/2-inch wide to well over 2 inches in width. Some are ornate with rounded curves, dips and shadow lines. Some are plain and simple like ordinary baseboards. Choose any design you like. If you have existing baseboards that you like, use them, or a smaller version to trim around the outlet so everything matches. Profiled moldings also vary in height from about 1/2-inch high to about 1 1/4 inches tall. Before purchasing the molding, try some scrap pieces on for size. If it's too tall, too wide, or just doesn't do it for you, test a few more pieces until you find what you like. If you want to trim the outlet, but don't want to make a big production out of it, try hardwood tape. This kind of tape is made from real wood. It's only about 1/16-inch thick with a sticky back, or heat activated glue that is applied with a hot iron. Cabinetmakers and woodworkers use it all the time to trim shelves or to add the finishing touch wherever they see fit. Cut the tape to size with scissors, peel the back off and stick it around the perimeter of the outlet. If your walls are textured, you might have to sand around the perimeter lightly so that the tape lies flat. The most common type of wood tape is red oak, but other species are also available. Use a stain marker to color the tape, or stain it with any type of wood stain. It's stains just like real wood because it's made from wood. Spray on a light coat of lacquer after staining. Make an outlet trim piece using 1/4-inch-thick hardwood plywood. Select almost any hardwood plywood of your choice. Cut it at least 1 inch bigger than the outlet on all four sides. You can make it rectangular, oval shaped, round or dream up your own shape. The design is up to you. Remove the original outlet cover from the wall, and use it as a template to draw the outline of the cover onto the center of the plywood. Drill a 1/2-inch hole through the plywood, insert the blade of a jig saw into the hole and cut out the opening for the outlet. Sand and finish the plywood as needed. Place the outlet cover back on the wall. Fit the plywood trim panel over the outlet cover. Use small brads or construction adhesive to attach the trim panel to the wall. Moldings look best when the corners are mitered. Miters are 45 degree angles that allow the molding to fit together at the corners. Use a table saw to cut the miters on the ends of each piece. Start by measuring the outlet cover from corner to corner. Miters have one long point and one short point. Cut the molding so that the short points of the angles represent the measurements on each side. Fit the pieces on first without attaching them. Check the fit. 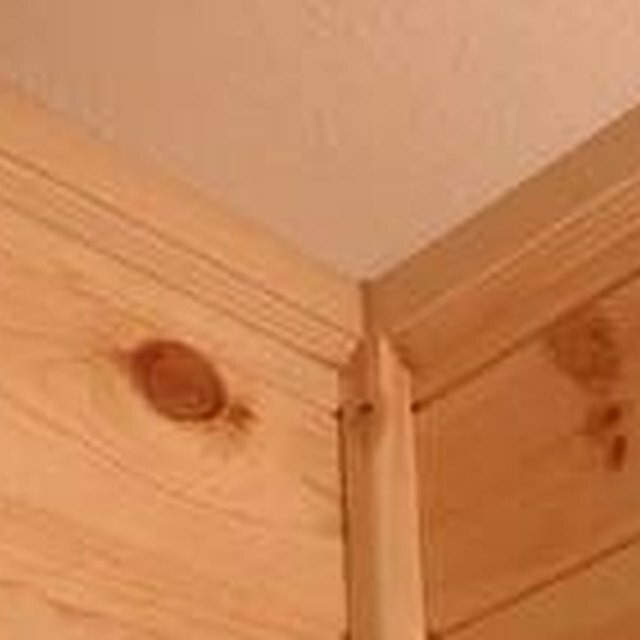 If the miters have gaps, trim a small amount from one or two of the pieces until they fit tight. This type of molding is light, and you don't necessarily need to hit wall studs. Ordinary construction adhesive is strong enough to hold the molding in place on the wall. For more holding power, use the adhesive and a pin nail gun, or even small brads to nail the molding in place. Use nails or brads that penetrate through the molding and at least 3/4 inch into the drywall.